She was the daughter of Thomas Adams Word and Justiana Dickinson. [S649] Unknown compiler, "The Money Tree", Ancestral File. [S257] Brent H. Holcomb, Marriages of Surry County, N.C. 1779-1868, page 225. [S1216] Joel Williamson, William Faulkner and Southern History, pg 16. 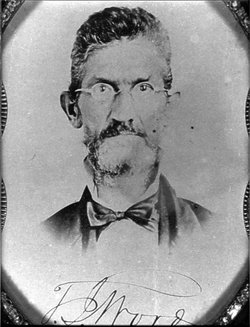 He was the son of Thomas Adams Word and Justiana Dickinson. Death*: Jane Worrel died on 29 July 1887 at NC . Marriage*: She married Doctor Mansfield Duke on 12 May 1840 at Warren Co., NC. [S522] The Daily Dispatch, 7 Feb 2014. [S242] Henderson Gold Leaf, 5 May 1887. Birth*: Agnes Wren was born circa 1858 at Granville Co., NC. Birth*: Allen Wren was born before 1780 at NC. [S198] Unknown author, Marriages of Bute and Warren Counties, North Carolina 1764-1868, pg 54. Birth*: Delitha Jane Wren was born in February 1827 at NC. She was the daughter of William Wren and Middie Clark. Marriage*: Delitha Jane Wren married Moses Bennett Faulkner, son of James Falkner and (?) Bennett, in 1843 at NC. Death*: Delitha Jane Wren died in 1905 at Bedford Co., TN. Burial*: She was buried after 1905 at Clark Cemetery, Bedford Co., TN. Birth*: Hugh Wren was born circa 1861 at Granville Co., NC. Birth*: Jennie Wren was born circa 1856 at Granville Co., NC. Birth*: Joel Wren was born circa 1783 at NC. Birth*: Lily Wren was born circa 1830 at NC. Birth*: Lucy F. Wren was born circa 1865 at Granville Co., NC. Birth*: Thomas Wren was born circa 1807 at NC. Birth*: William Wren was born circa 1797 at NC. Birth*: William Wren was born circa 1827 at NC. Marriage*: He married Mary (?) circa 1855 at Granville Co., NC.